Lots NEW! Last but not least, more pet animal printables! We have printables clocks, place cards and name badges, doodle pages and much more. Use these bunny name badges for Easter parties, Easter egg hunts, the classroom, place names and so on. Decorate your desks or table with these six funny bunnies - perfect for Easter or any time! Fold in half so that they stand up on the table or desk and write names on the front. We have included a version with handwriting lines so that younger children can write their own names. Print out these cute little Easter bunny egg cup printables. Cut out, fold and enjoy a special Easter morning boiled egg and soldiers. Please be aware that a cardboard egg cup won't support an egg which is taking a lot of bashing! These large, cheerfully coloured fish are sure to brighten up the classroom! Have them swimming around the room in order or use them for sorting activities. This printable has 10 fish, 1st to 10th. This fun printable scrapbook paper is covered in fish of all shapes and sizes and colours, and makes a useful addition to the craft cupboard. You will need the password ActivityVillage.co.uk to open and print this scrapbook paper. Isn't this black cat scrapbook paper design fun, with the "evil" grin on the cat's face? Here's a very cute hamster alphabet and number printable which you can use to decorate scrapbooks, in the classroom or in all sorts of crafty projects at home. It helps to make learning fun! Lower case letters and numbers 0-9 included. Use our fun hamster notebooking pages for somewhere to write down notes on how to look after your pet hamster, perhaps? 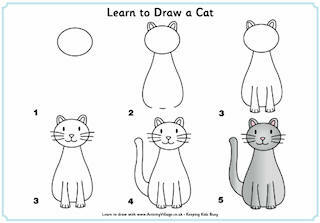 Children love drawing pictures of their pets, and they can use this fun picture gallery to draw lots of lovely artwork or maybe cut and paste some photos? Maybe they have more than one pet, or they might want to draw the same pet doing different activities? This adorable pet animal vocabulary die is a fun way to help develop vocabulary skills and encourage creativity. Print, cut out and glue the die, then use for fun vocabulary games or as a story starter. This pet animal vocabulary die is so much fun that the kids won't realise they're learning too! Use for vocabulary games or for sparking creative writing. We have two versions to choose from: pre-coloured, or black and white so the children can colour the pictures in themselves. Our cute pet animal vocabulary matching cards can be cut out individually and used for matching games or folded to make two-sided cards to test vocabulary. Here's a set of 15 useful word cards with all the different pet animals we could think of. Perfect for labelling displays and vocab activities. You won't find some of the more exotic pets among our pet animal word cards but we think we've included 9 of the most popular! This 10 page pdf has 5 different size scottie dogs per page and 10 different colours. Print, cut out and laminate and use for all sorts of sorting activities.